A long time favorite, the Velvet Finger Montipora is easy to keep and a great coral for beginners! The Velvet Finger Montipora Montipora digitata looks smooth and fuzzy on its surfaces. The polyps of Montipora corals are tiny and uniform, and on many species including the M. digitata they are fuzzy. 'Velvet' is a name given to a number of the large types of Montipora corals. Some other names they are is known by are Velvet Coral and Velvet Branch Coral. The M. digitata is an encrusting, yet mostly branch formation that can be brown, green, and even purple and peach in captive raised varieties.The Velvet Finger Montipora has a combination of growths; encrusting on surfaces, and then multiple upward growth, with thin branches that fork in multiple directions. The "surface" is smooth looking and the polyps are small and fuzzy. 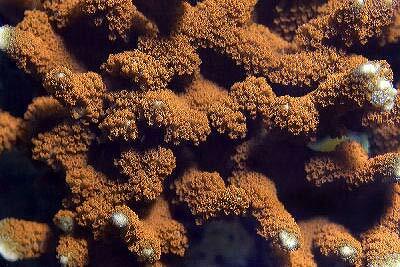 The little tiny polyps make this look like velvet, thus its common name.. The Velvet Finger Montipora is not only attractive, it is easy to find and moderately easy to care for. One of the easiest of the small polyp stony (SPS) corals, it makes a great beginners stony coral. Even if you do not have enough light, it will turn brown or tan, but will not die. They actually exchange the type of zooxanthellae they need to adapt to the level of light. Once established, it will provide you with ample opportunities to frag. Distribution / Background Montipora Coral Information: The Velvet Finger Montipora Montipora digitata was described by Dana in 1846. Some common names they are known for are Velvet Coral, Velvet Finger Coral, and Velvet Branch Coral. Where Montipora Corals Are Found: The Montipora digitata are found in the western Indian Ocean and then eastward to Fiji, it is also found on the Great Barrier Reef. Montipora Coral Habitat: M. digitata are found in are mostly shallow mud flats, turbid lagoons and other shallow locations. Montipora, as a species, are found from deep water (greater than 10 meters / 33 feet) to the reef crest and from clear oceanic reefs to turbid (not clear because of stirred-up sediment, etc.) lagoons. Even though their range is large, Montipora are more likely to be found in quiet water at mid-depths. Status The Montipora digitata is not on the IUCN Red List for Endangered Species. Description What do Montipora Corals look like: The M. digitata have very porous and lightweight skeletons. They are a plating species of small polyp stony (SPS) corals. It has an encrusting, yet mostly branch formation that can be brown, green, and even purple and peach in captive raised varieties. It resembles the Porites cylindrica, but the branches are thinner, typical in captive animals. The Velvet Finger Montipora have a very fragile, light weight skeleton and care needs to be taken when cleaning your tank, since one bump will supply you with multiple frags. What is really cool is you can just put a "stick" or branch of one into a small hole of your live rock and the M. digitata will start encrusting, spread and start more "branches" once it feels comfortable. Difficulty of Care Montipora Coral Care: The M. digitata is easy to moderate to care for, accepting a wide range of lighting and water movement. Unlike Acropora, which are in the same family, Montipora corals do not stress as easily and are more resistant to bleaching and disease. Some credit this resistance to their deep-set polyps. They are easy to propagate as and are a perfect specimen for the captive reef environment, and are recommended for beginners. A well-feed live rock/reef environment is what is needed for your Velvet Finger Montiporal, along with some fish for organic matter production. These corals are usually hardy and fast-growing, however a mature tank is recommended. Like other Montipora, they adapt to lower lighting and water movement. For tanks with metal halides, position your Monti in the mid levels. With other lighting, position your Monti at the upper to mid levels depending on the watts used. Your Monti will show whether it is happy or not by the coloring. Make sure that no other corals or even algae can come in contact with your Montipora. Monti's are mild mannered and will end up loosing any chemical warfare. In general, if your M. digitata has any kind of tissue recession, just cut off the healthy part. Just make sure you cut into some of the healthy part also, to be sure there is no disease encroaching on the healthy tissue. Also, keep out the cyanobacteria and algae with good water movement, and your Monti will stay happy. Availability Montipora Corals for Sale: The Velvet Finger Montipora M. digitata is very easy to find at pet shops and on line. Online they can run about $29.00 USD or more depending on size. Aquacultured specimens and frags are available.